Brussels: More than a year after the entry into force of the EU’s law governing timber trade, a survey by WWF confirms that many EU countries are still failing to halt the entry of illegal wood products into the EU markets. WWF’s EU Government barometer, conducted in the first half of 2014, shows that only 11 EU countries have so far adopted national legislation and procedures considered robust enough to control the legality of timber and timber products. All other 17 countries have either not adapted their national legislation to the European law or have adopted legislation where low sanctions or dysfunctional prosecution systems are considered obstacles for an effective implementation of the law. The WWF barometer comes a week after the European Commission (EC) published the deeply worrying results of its scorecard on the national implementation of the timber regulation. WWF urges the European Commission to use the results of the surveys to put more pressure on national governments and take legal action against non- compliant countries. “There is no excuse to further delay national actions to prove and guarantee the full legality of the products European consumers buy. 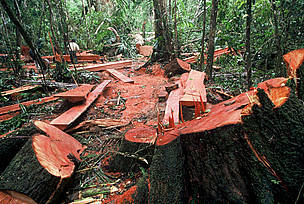 Trading in illegal timber is a crime and it needs to be treated and sanctioned as such,” said Schulmeister. Illegal logging has devastating environmental, social and economic impacts on some of the most pristine forests in the world and the people who rely on them; this illegality also affects European businesses and consumers who comply with the rules. It accounts for 30% of the global timber trade and contributes to more than 50% of tropical deforestation in Central Africa, the Amazon and South East Asia. Cutting forests illegally results in lost revenues estimated at 7 billion euros per year, damages legitimate operators, locally and in Europe, causes deforestation, biodiversity loss, increases greenhouse gas emissions, and also threatens the livelihood of local communities. In 2011 the EU accounted for 35% (€37.8 billion) of the global trade of primary timber products. As acknowledged by the European Commission, even if it is difficult to estimate what percentage of this trade was in illegally harvested timber, the EU is an important export market for countries where levels of illegality and poor governance in the forest sector are most serious. “We need to guarantee that forests are managed sustainably, that local environment and communities are protected and that European markets are not disrupted and damaged by illegal low price products,” said Schulmeister. Illegal logging contributes heavily to the destruction of biodiversity and the impoverishment of millions of people that depend on forests for food and income.